Considering buying a MacBook over a Windows laptop, but not sure which one to get or when? Well, even though you have only a handful of choices when it comes to Macs compared to the plethora of Windows options, it’s still not necessarily an easy decision, especially considering you have to shell out a lot more money on a Mac. As of now, you have the following choices when it comes to Mac laptops: The new 12-inch Retina MacBook, the older MacBook Air, the 13-inch non-Retina MacBook Pro and the 13 and 15-inch Retina MacBook Pros. In this article, I’m going to discuss the differences between these models and also talk about the current state of all the MacBooks and whether or not you should even bother buying a Mac, especially right now (June 2016). The first thing you should ask yourself is whether or not you should buy a Mac right now. Apple creates great products and their hardware definitely includes some of the best designed laptops on the market. With that, Apple also tends to release these great products at very large time intervals. By the time they release their next great version of a particular laptop, which could take years, Windows laptops will have copied and surpassed the Mac. Take, for example, the MacBook Air. It was released about 6 years ago and the design hasn’t changed a bit. Of course, the internals have been upgraded, but not as fast as on Windows laptops. They still have Intel Broadwell (5th generation) chips whereas you can easily buy a Windows laptop with a Skylake processor (6th generation). My first recommendation is to go to the MacRumors Buying Guide and follow the advice there. Their recommendations are always current, so even if you are reading this article 6 months from now, their recommendations for when to buy will always be more accurate than what I can try to predict. Note that you should only use this guide as a way to determine whether you should buy a particular Mac right now or not. It’s not really a guide to help you decide which Mac to buy. As you can see with all the red, most of the recommendations at this point are to not buy. This is because most of the laptops haven’t been updated in a very long time and paying full price for a machine that has parts that are several years old just doesn’t make any sense. In my opinion, no one should ever buy the regular non-Retina MacBook Pro. It’s expensive and it has been updated in almost 1500 days. So that basically leaves you with the Retina MacBook Pro, MacBook Air and MacBook. According to most rumor sites, we’ll see big upgrades to the Macs in September or October of 2016, in which case the Retina MacBooks will be the clear choice for power users. On the less expensive side, it’ll be tough to say. Some people are saying that the MacBook Air will be removed since it’s very similar to the new 12-inch MacBook, which is a much better option right now over the Air. Now let’s talk about the differences between the laptops. The biggest difference in my opinion between the different laptops is retina vs non-retina. A retina display basically has more pixels packed onto the screen, giving you a higher resolution than 1080p. So far, on the Mac laptops, retina does not mean 4K. You can only get a 4K or 5K display from Apple if you buy an iMac. There are Windows laptops from Dell, etc. that have 4K screens, but everything is scaled up because a 4K native resolution on a 15 inch or 13 inch screen would make everything extremely tiny. What I like about the Mac retina resolutions is that you can keep it at the native resolution and still use the computer (if you like things small, but not tiny). If you’ve never used a retina display, then you can still consider buying a non-retina laptop. Once you have used a retina display, however, you will find it very painful to go back to a non-retina display. Everything is much clearer and crisp and make a big difference, especially if you are in front of the computer for several hours a day. If you can get a Mac laptop with a retina display, you will be much happier with your purchase. The only advantages to buying a MacBook Air are that you can get a slightly bigger screen size (13.3 inches), a slightly faster processor (up to a dual-core i7), slightly better battery life and a couple of USB and Thunderbolt 2 ports. Other than that, the 12-inch MacBook beats out the Air on everything else. For me, personally, the retina display makes up for any of the other small disadvantages. If you’re going for the higher end MacBook Pro laptops, don’t even bother with the non-retina display option. That’s probably going to be eliminated very soon anyway. I mention ports next because this could be a deciding factor for some. On the 12-inch MacBook, for example, there is literally just one port: USB-C port. This is a new iteration of USB and will probably be the future of USB, but not many devices use USB-C yet. This means if you need to connect anything to the MacBook, even a regular USB flash drive, you’ll need an adapter. This can be annoying for some and not worth the slim size and light weight. Also, the USB-C port is used to power and charge the laptop also. On the MacBook Airs, both the 11-inch and 13-inch almost have the same number of ports: two USB 3 ports and one Thunderbolt 2 port. The 13-inch model also has a SDXC card slot, which you can use for transferring pictures and videos from your camera, etc. Both models have an audio-out jack and a MagSafe port for power. Next, we have the retina MacBook Pros (13 inch and 15 inch). Luckily, both of them have the same exact ports: two USB 3 ports, two Thunderbolt 2 ports, one HDMI port, and one SDXC card slot. Lastly, even though you shouldn’t buy one, the non-retina MacBook Pro has a couple of ports not available on the other laptops. If you really need an Ethernet port or a Firewire port, then this laptop has it. It does not have an HDMI port, however. The rest of the specs like CPU, memory and storage really all come down to your use case. If you want to do heavy video editing using Final Cut Pro, then it’s probably a smart idea to get a Mac with an SSD, a core i5 or i7 processor and at least 16 GB of RAM. If you absolutely need 16GB of RAM, then you have to purchase a Retina MacBook Pro. 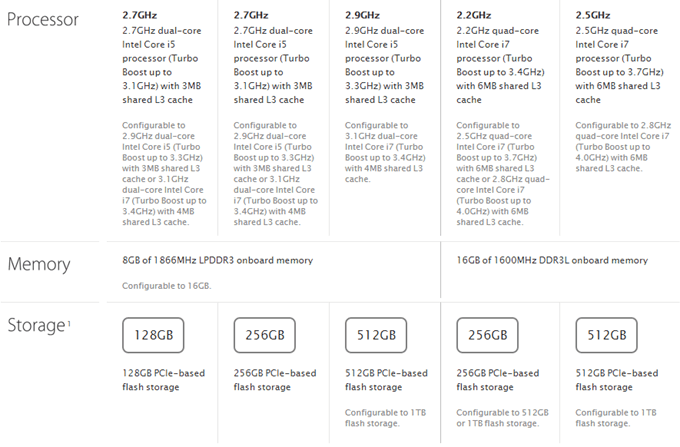 If you want 512 GB of flash storage, then you can cut out the MacBook Airs since they only go up to 256 GB. The other big differences here are the CPUs used inside each laptop. The 12-inch MacBook uses Intel Core m3, m5, or m7 processors. These are kind of like the Intel Celeron processors back in the day. The MacBook Airs move up to dual-core i5 and i7 processors. Finally, the retina MacBooks Pros move up to quad-core i7 processors (on the 15 inch). 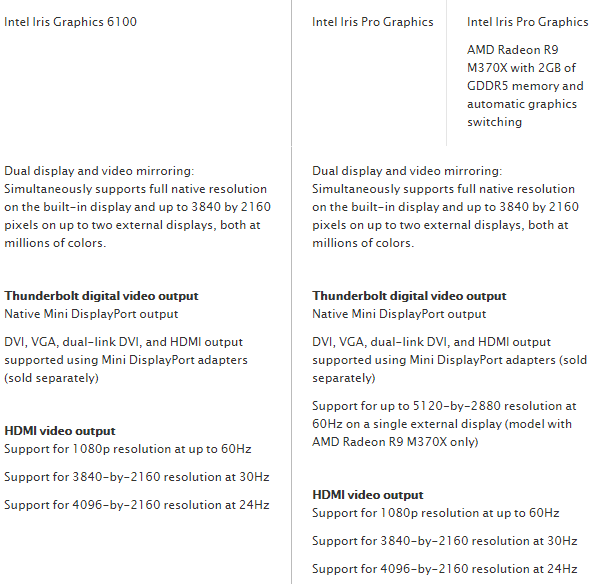 Finally, the last major difference between the laptops is the graphics card. 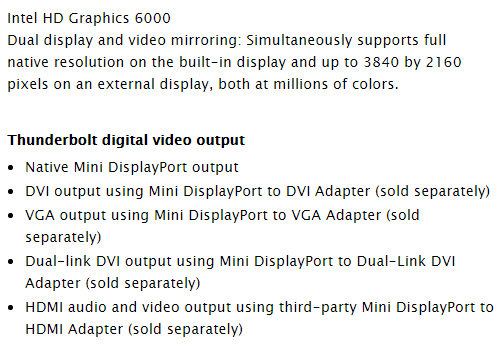 It’s worth noting that the only machine with a discrete graphics card is the 15 inch Retina MacBook Pro. So if you want a discrete graphics card, you only have one option. However, it’s also worth noting that Macs are not good setups for gaming. Don’t buy the 15 inch Retina MacBook pro for gaming because you will be disappointed. If you work with CAD applications, video editing, etc., then it’s a good choice. Both the 12-inch MacBook and the MacBook Air can output to the computer display and to an external display at 3840×2160 at the same time. On the MacBook Air, you can also output to DisplayPort, DVI, VGA or HDMI using the Thunderbolt 2 port and an adapter. There are other minor differences between the machines, obviously, but I don’t think they are deciding factors when making the purchase. For example, the 12-inch MacBook comes with a 480p FaceTime camera, which is just bad, but not the end of the world. Battery life on all the machines is pretty good for a laptop and not something you really have to worry about. As mentioned, don’t ever buy the non-retina MacBook Pro and don’t buy anything other than the 12-inch MacBook until the end of 2016, when hopefully everything gets a major refresh internally and externally. Enjoy!